Sander Ejlenberg, Anna Witteman, Willem Verkerk, Bas Bijpost, and Hei-Yu Tang. Mobile is intense, intimate and frequent: the ultimate medium to connect with consumers and gain their loyalty. In order to preserve its role as supermarket pioneer and innovator, the mobile application ‘Appie’ was launched in 2009. It’s now available for iPhone and Android (and web, which is outside the scope of this submission) and is still being expanded with new and useful features. With Appie, users’ experience around grocery shopping is elevated to a fun, inspiring and easy process by taking the classic shopping list to a whole new level. Before going shopping, users can browse a database of tens of thousands of recipes, find stores near them, check opening hours, and create their shopping list using numerous ‘sources’: previous purchases, special offers, recipe ingredients, a bar code scanner, and manual and voice input. The list can even be synchronised across devices, enabling people to work together on the weekends’ groceries. 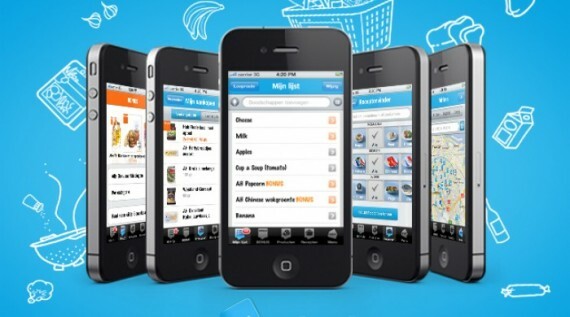 In an Albert Heijn store, Appie will help customers find the most efficient route by sorting the items on the list in the right order. And after shopping, users can switch to Cooking Mode, making it easy to follow the steps of recipes, using the ingredients they just bought. 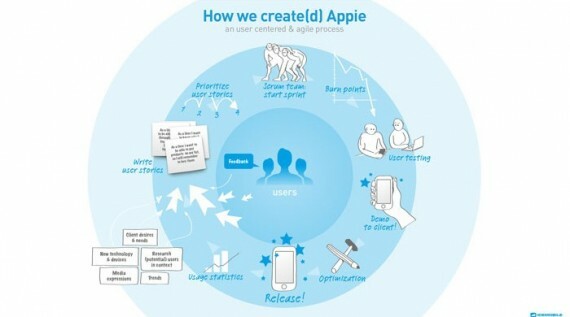 Appie was launched in 2009, a year after the introduction of the iPhone on the Dutch market. It was the first service-oriented application by a supermarket chain in The Netherlands. The target audience was very diverse, from tech-savvy students to mothers running big families. The possibilities for creating relevance for these people were numerous. Using Scrum methodology enabled us to efficiently design, prioritise, implement and test ideas. Frequent releases, built-in Feedback features, careful monitoring of conversations in social media, thorough analysis of usage statistics, and Albert Heijn’s extensive knowledge of their customers provided invaluable insights which were used to create new and improve existing features. We’ve combined these insights with classic concepts (e.g., a shopping list and a recipe book) and opportunities offered by the mobile platform to offer relevance where and when customers need it and most appreciate it. From the very first version in 2009, with more than 200,000 downloads in the first three months, Appie has expanded across other platforms, first to Android and later also to web. For each platform the device-specific interaction was respected, while preserving the recognisable user experience of Appie. At this moment Appie is the most popular app of the Netherlands with over 1,100,000 downloads. It has become an integral part in the daily routine of over 300,000 people, referring to the service as ‘my appie’. Albert Heijn receives a lot of positive feedback from its users, which is used for the development of future releases. Users recognize their own feedback in the updates and feel that Appie listens to them. For Albert Heijn, this made their relation with the customers more personal. Albert Heijn scored the number one position in an independent research about empathetic brands; Appie played an important role in this number one position. Appie has established Albert Heijn’s role as a pioneer and innovator in servicing customers, gaining both emotional as well as transactional loyalty among its user base. Central to the design of Appie is the shopping list. It’s used for preparation and during shopping. We set a goal to transcend the conventional way of doing groceries and creating lists: persistent behaviour which is difficult to change. Our mission became to beat the pen. One way we did this was by simplifying means to add groceries to your list. Previous purchases, current offerings and even full recipes can be added to your list by the touch of a button. Later releases added bar code scanning and voice input. By letting users sort their list according to the walking route of a store of choice, we provided them with another important benefit over the paper list and pen. To introduce and explain new features to the less tech-savvy users, we added hidden surprises, movies or sounds that reward people for using certain features. Users became fanatic in searching for these Easter eggs, and were very keen to share them with friends and family, thus demonstrating the fun and explaining the ease of use of Appie.